Question: I moved the top cork thing from the top of my flute and i was wondering if moving it would change the sound of my flute? 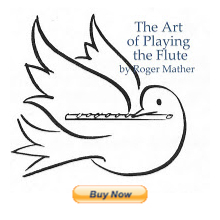 Ah yes; the mystery of the flute's headjoint cork and what it does. That cork, with the silver discs on either end, hidden inside the tip of the headjoint, is what sets the flute's tuning. If the cork in your flute's headjoint moves easily when you try and move it, then it's definitely time to take it to a reputable fluterepair shop and have a minimum of $10 worth of repair. Why? a) Flute headjoint corks shrink over time, from so often being wet and then dry. They have to be adjusted and checked each year when your flute goes in for its regular servicing, so that the cork has an air-tight fit. Any cork that moves easily has already shrunk and is not doing its proper job of making an air-tight seal at the crown of the headjoint. b) If your cork moves too easily, often you will also hear stuffy or muffled tone quality because air is escaping around the cork, which it shouldn't be doing. c) Also, if your cork moves too easily (you can simply pull on the crown or push on it with your swab and it moves), then you may unwittingly move it when swabbing the headjoint, and put your whole flute out of tune. The cork's exact position affects the tuning of the flute. Too far out, the left-hand notes will be flatter. Too far in, the left-hand notes will be sharper. Either of these positions will put the scale of the flute out of tune with itself. A healthy flute headjoint cork is very difficult to move by yourself. Some brands even use a rubber O-ring (Mateki for example) in attempt to make the ultimate air-tight seal. So if it's incorrectly positioned (not at 17.3 mm or the line on your cleaning rod is NOT in the middle of the embouchure hole) then you should only reposition the cork with expert help (your private teacher or a reputable flute technician). In fact, have your flute teacher double check your flute both visually, and with a tuner, so that you can know for sure that you've got the cork in the perfect spot to have all three octaves of the flute in tune. On average, corks are replaced and/or tightened by a flute technician every 3 to 7 years. A PDF for beginners that illustrates how the cork should be positioned for placing the flute's length correctly for tuning is here. Articles about headjoint corks (courtesy of Miyazawa and Brannen companies) are online here. In general, yes, moving the cork will affect your flute's scale andpitch, but a leaking cork will affect your sound. You can test for a leaking cork by creating suction on the headjoint, and listening for a hiss coming from the crown. Let us know what you discover about this; and whether your cork is in fact leaking, thus affecting your tone quality. Thanks for your website which I find both interesting and informative. Not so much a comment about snugness of fit etc but have you tried using a stopper and crown of different materials? Robert Bigio (for example) advertizes Delrin and Zirconium which are supposed to improve the tone and projection. I use a silver lined thinwood headjoint and (in common with everyone!) am always trying to improve my sound. The cost of these stoppers isn't that great, so I was thinking it's probably worth trying anyway, but before I take the plunge thought I would ask if you have tried one, and what, if any, difference you found. good question; the sound samples that were done by Raymond Robinson showing exactly what each crown and stopper does are on my mp3 radio show called Fluteloops. Show no. 8 covers this topic with sound samples and spectrums. Sorry! I had missed that one. Fascinating, and from the samples I would say more a difference in tone rather than any one sounding better. I think the comments made by both yourself and Raymond about the most important influence on the sound being the player is really the one to stress. I shall practice more... but I may treat myself to a new stopper too! I just had a lesson today with a new private teacher, and I have read so many articles that your not supposed to touch the cork once it's in the standard position. My flute is brand new and I checked the position and it had been in the right spot, lined up with the cleaning rod. Today my new teacher said I was not in tune with her, that I was higher and she unscrewed it so that my flute would be longer and then pushed it, but it only screws, so I don't know why she pushed it. Is this a bad sign? Should she have not moved it? Also I don't wanna have to re-tune it to my teacher every time I have a lesson so should I leave it even if it's not the "standard" position? I don't wanna put unnecessary wear and tear on it. Perhaps your teacher's cleaning rod and your cleaning rod have the mark of 17.3 millimeters etched into the rod in a slightly different place. Apparently there are cleaning rods that are mismarked circulating out there in the thousands. I was reading about this the other day; they are mismanufactured. So simply compare your two cleaning rods very closely at your next lesson in order to rule this out. Also, measure your own marking with an accurate ruler to make sure it truly is 17.3 mm. She didn't go by the cleaning rod she said that my flute was higher than hers and I needed to make my flute longer so she just screwed it out , she didn't put it to a standard position. I'm not sure if she just wanted me to tune it that one time like that or if she does this often..but the way she talked about seemed like she does it often. I guess I will just tell her what I have read and see what she says I just don't wanna come across as a know it all, but I don't want a damaged flute either! I'll let you know what happens, thanks for your time. Thanks for your further details. I guess it's possible that your teacher might have missed the "17.3 mm" information in her travels. Stay polite/curious and fairly ask about the methodology of cork-moving and how it works. As far as I know, the 17.3 mm. rule is a standard flute manufacturer's measurement. The concensus is that no flute can play in tune with itself if you deviate more than a quarter to a half turn of the headjoint's crown. Phyiscally moving the cork to 18 or 19 millimeters would mis-scale the placement of the tone holes and put the flute out of tune with itself. I've met lots of less experienced or "non-internet reading" flute teachers who don't yet fully understand the exactitude of headjoint cork placement. If one takes the time to graph the flute's pitch on every chromatic pitch, using a mezzo forte dynamic level, a tuner, and a simple graph (as found as Seven Steps to Intonation by Chris Potter) a flutist will be able to design an experiment that shows how cork distance affects the flute's ability to be played in tune with itself (overblowing octaves and fifths.) It's simple trial and error to put a flute's cork in the best place for tone quality and sound, but it shouldn't deviate too far from the industry standard. NOTE: Adjusting the tuning cork forward or back does not adjust overall intonation of the flute up or down universally. Although you will succeed in sharpening or flattening overall, movement out of center will relatively flatten the upper register and sharpen the lower or visa versa. This will distort the scaling of the flute. Position of the cork is measured as follows: the length of the end plate to the center of the embouchure hole is equal to the diameter of the tube at the center of the embouchure hole. This measurement is most commonly 17.3mm. Physics determines the proportions! Flutes are designed to play most in tune with this proportion set properly and proper tone hole placement (scaling). What is the correct pitch to aim for when playing just the headjoint open and with the end covered? I play saxophone and this is an important tester to see that your embouchure is correct. If you get the right pitch from the mouthpiece alone many tuning/intonation issues are solved. I understand that the pitch is somewhere around a C#, but that is not the method that flutist's use, as the entire scale length is a D (not including footjoint pitches). Also, many flutes today are pitched at A-442, not A-440. well i play the flute and the cork in the flute head joint just keeps comming out. i dont know what caused it. i just want to know what can be done to fix it..or if it needs to be taken to a flute shop. email me at stokes_raven@yahoo.com for an answer. suffers from humidity (wetness) followed by dry conditions. Any natural cork shrinks and ages over time, and even faster if constantly wetted. Once the cork's all-important air tight seal is broken the cycle of wetting and drying increases the cork's rate of shrinkage. Having the headjoint cork re-fitted, re-adjusted, or replaced is a very quick and inexpensive flute repair task. Eventually a headjoint cork left to age will become loose, will become pushed around by your cleaning rod, and finally will start to fall out. At this point the flute is almost unplayable, but since you've grown used to the airy sounds so gradually, you haven't realized what has happened to the sound. You probably are blaming your embouchure, when in fact the air is leaking out the crown end of the flute in increasing amounts. Usually this kind of loose cork situation occurs when students are playing a "band flute" from their school, and the school's instruments have not been adequately checked over and repaired over the summer. If this is the case, tell your band teacher (for me) to make sure the flutes are repaired prior to being re-assigned in September. Or, if you are the owner of the flute, and the headjoint cork has become this shrunken and loose, this means that in all the time you've owned the flute, you've rarely (hopefully not "never") taken it to a flute repair shop for its necessary annual visit. During the annual repair (once yearly- more often if you play more than three hours a day), the flute technician's first order of business will be to check the air-tight seal of the cork. If it needs replacing, the cork will be replaced for about $10. I'm constantly surprised that young flute players don't know about the need for annual repair and adjustment for a working flute. Band teachers should explain about the cork, the pads, and other care advice when they hand out annually maintained instruments. Ask the top flute players in town whom they send their flutes to for annual repair and adjustment, and gamble that $10 on a newly fitted cork. You'll be absolutely AMAZED at how great the flute sounds when the cork is properly air-tight and well fitted. The crown and stopper you mention is number 8 shown on this sound graph and with accompaning sound test on mp3. All these things you describe are normal. The flute allows an incredible amount of variation for the embouchure to adjust to it. Many flute students find that for a time, they need to push the headjoint all the way in; and usually it is because they are covering more of the blow-hole and blowing at a low angle. Later, when they learn how to use the very center of the lips more precisely, they can uncover the blow hole, and pull the upper lip more downward. It's a developmental process that takes time and frequent experimentation. It perhaps takes five years. If you are changing the headjoint's alignment to the keys, you will want to decide based on the comfort in your hands arms and wrists. The lower lip coverage of the blow hole does not have to be related to the changing of the headjoint to the body of the flute. The face and lips are able to make changes that give a good tone and pitch in many headjoint positions. i have a bamboo flute and the coke doesn't have natural wax on it to fixate it. can I use industrial glue to do so?? Sorry, I don't know anything about bamboo flutes. Contact a bamboo flute maker through a shop that sells bamboo flutes, maybe? Thank you very much for your knowledge. It is great to read you. I write you because I wonder how the placement of the head joint affects in the sound when the cork is in the right position (17.3 mm). I am experimenting pulling in and out the head joint, of course, always trying to keep the right toning. I feel that when I pull out the head joint, the sound is too dark, with out resonance. All the contrary when is pulled in, more alive and, for me, easier to play. My experiments are pulling out the head joint from 2mm to 5mm aprox. Is there some standard measure? What do you think about that? All the best from Spain! Hi , Well I have run into some problems with my flute, and I need help as soon as possible ,as you see my spring concert is tommrow. The cap at the end of my flute (the thing you use to tune your flute) doesn't tightnen hard enough. I can keep twisting it and twisting it and twisting it until infinity and the cap will never tightnen ! Its also out of tune please help me ASAP ! Do you have a flute repair person or a flute teacher nearby? Let them put the cork back into place for you. Then, never tighten the cap again. When you turn the cap clockwise it pulls the cork outward, making the flute flatter and flatter. The cap should be set in place with some nail-polish if it's that loose, once the cork is set at 17.5 mm. Good luck finding a local expert in time for the concert. I have Korean flute (Sogeom), side blown. It is closed on top and hollow through out the body. Does the head cork make a flute work? I blow in the side hole, no dice, no sound. It is just a tube with holes. What does this need to work? 1. Try googling the kind of flute you have, and look for instructions or videos on how to play a side-blown flute. You may have a kind of flute that needs a precise angle of the air to make a sound, or you may need a teacher. 2. Find someone in your area that plays ethnic flutes (like the kind you have) and ask them to take a look at it and/or show you how to play it. I play the orchestral silver flute. I don't know anything about ethnic flutes. Sorry. I am the first chair in my marching band and there's this one girl that has no cork on her flute ( as in there's holes on the end of each flute now) and even when she in tune she sounds so different compared to everyone else. Why is that? The crown is the silver end-piece that covers up the cork. When the crown has fallen off, or become lost, you still have about half an inch of black space before the cork starts. So perhaps you are observing from a distance, and haven't peered in the cork end. Under the crown is a half inch of air-space, then comes a metal plate (circular) around a screw thread, then comes the cork, which you cannot see. All that you can see is that the tube is blocked and no light is coming through, from where you're sitting that is. The crown is only for decoration and doesn't do anything much. The cork is likely still in there. Therefore she sounds the same as everyone else. And did you mean she sounds SO different? Or NO different. It's hard to guess which. Because if she sounds SO different, then maybe the cork *is* also missing, as well as the crown, or end-piece. If my head joint cork is "used" does the flute sound airy? If your cork is old, is it possible that it will shrink, crate air-gaps in the crown, and so then make the flute's sound airy? The answer to that is YES, that is very typical. Corks last ten years approx.